Defense counsel filed a motion today in San Francisco Superior Court seeking to overturn Mayor Ed Lee's suspension of Sheriff Ross Mirkarimi. File photo by Luke Thomas. Editor’s Note: This report has been updated with a response from City Attorney Dennis Herrera spokesperson Matt Dorsey. March 27, 2012, 9:00 am. 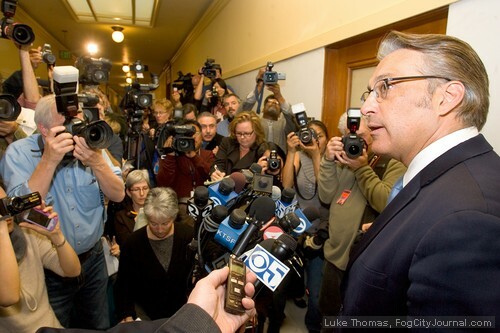 Defense counsel representing suspended Sheriff Ross Mirkarimi filed a writ today in Superior Court seeking to reinstate the former District 5 supervisor as the lawfully elected Sheriff of San Francisco, Fog City Journal can report. Mayor Ed Lee “acted outside his legal authority” when he suspended Sheriff Mirkarimi, according to Mirkarimi’s new defense attorney, David Waggoner. Mirkarimi pleaded guilty last week to one count of misdemeanor false imprisonment stemming from an alleged domestic violence incident involving his wife, Eliana Lopez, on New Year’s Eve. He was sworn into office January 8. – The conduct at issue occurred before Mirkarimi assumed the Sheriff’s office and cannot be the basis for suspension. – Mayor Lee’s summary suspension of Mirkarimi, without pay, for a misdemeanor which does not constitute moral turpitude, is a denial of due process. – The language of the Charter defining “official misconduct” is unconstitutionally vague. Mirkarimi defense attorney David Waggoner. Waggoner, a litigation attorney who enjoys a reputation for leaving no stone unturned, has successfully defended several high-profile clients before the city’s Ethics Commission, a five-member quasi-judicial body consisting of political appointees. Waggoner will ask the Superior Court to set a court date to hear arguments on the writ in the next week. If Mirkarimi is unsuccessful in Superior Court, the city’s Ethics Commission is charged with holding a hearing – expected to begin in late April when Ms. Lopez returns from a court-approved visit to her native homeland, Venezuela – and submit its findings to the Board of Supervisors for a vote. Nine of eleven supervisors, or three-fourths of the Board’s sitting members, must vote in the affirmative to remove an elected official from public office. The Ethics Commission proceeding is without precedent and could involve an interesting witness list, Waggoner said. 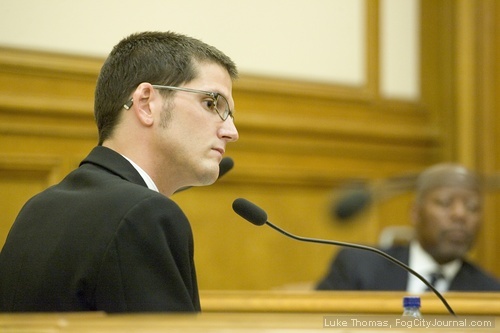 Comments for Mirkarimi Defense Files Writ to Overturn Lee’s Suspension are now closed. Whoever wrote that chunk of the Charter should be removed from whatever office or post he or she holds at City Hall for illiteracy as well as bad lawmaking. I’ve been Ross’s harshest critic in SF, but City Hall’s attempt to destroy him based on this incident is shocking and unacceptable. Mayor Lee’s stated reasons for removing Ross from office are clearly inadequate as a matter of law. City Hall should make public the City Attorney’s memo to the mayor to allow the public to evaluate the quality of the legal advice the mayor is getting. @DavidinSF , would you classify Mirkarimi’s wife as “people from all walks of life” ? If some people thought Mirkarimi was going to roll over and die they were very, very mistaken. if I was mayor Lee I would be looking of ways of protecting my arse, and see who could take the blame for this cluster f..k.
@Frank: I went through an episode like this with another Frank, who happens to be a friend of mine: Frank Habineza, President of the Rwandan Green Party, such as it existed or, rather, tried to exist in 2010. Frank Habineza is also President of the African Greens Federation. I told him I didn’t appreciate that and didn’t think that Frank’s wife would either, especially not on International Womens’ Day, which it happened to be. Edmund, bty, is also the Associated Press’s stringer in Rwanda, though I know Edmund’s prose well enough by now to see that the words, if not the viewpoint, are rearranged a bit by AP editors. Ross will not be thrown out of office by the ethics commission or BOS. He will keep his job because this all occurred before he was Sheriff. But this has not been a railroad job, or a conspiracy started by his political opponents – Ross alone is to blame for his mess. He and he alone brought this upon himself and his family. The media have jumped on this, only becaus it helps sales of papers and advertisers, and while others who don’t agree with his views have jumped on the anti-Ross bandwagon, remember – they didn’t create this. Ross did. 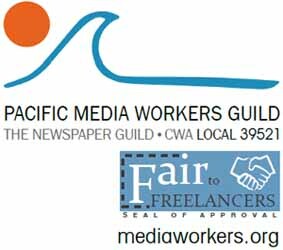 @h.: Thanks for the rundown on David Waggoner’s accomplishments. @Bob: Ross didn’t argue that it wasn’t a crime because he wasn’t in office. He pled guilty to a misdemeanor. Mirkarimi continues to display profound arrogance. At what point in any of this process did he NOT attempt to sidestep rule of law with technicalities? Tried to argue that it wasnt a crime because he wasnt in office. This is not how someone in his position should act. Waggoner stopped Downtown/Jim Sutton/Ethics Commission railroad jobs of Carolyn Knee who was attacked for miniscule paperwork shortcomings when she was unpaid volunteer treasurer of a Public Power measure a few years back and after that he pulled them off Tony Hall’s throat. In both cases the Mabel Ng run (behind the scenes she’s in charge) … the commission settled for a few dollars after much bluster and threats. In Hall’s case Waggoner revealed in open ‘court’ that a key piece of evidence (a check) had been altered to frame Hall and Newsom’s star witness took the 5th on the stand. And, Ross … I saw retired Fire Union prez John Hanley on my daily walk through Aquatic Park today (he was swimming) and he said to send you his best and his belief that enough was enough and that you’re being persecuted. Giants win on Sandoval’s 9th inning 2 run blast! I am in total agreement with Lou Gordon and with Ann Garrison, above. This case reeks and if you can’t smell the corruption you’d better get your nose checked. Ross is fighting the good fight, at great personal and financial cost, and he is a hero for doing so. But this is about far more than Ross Mirkarimi and his family. Every so often a political machine will overreach itself so egregiously that it becomes plain for even the common citizen to see. I believe we are at such a turning point in SF. Despite all the salaciousness, vicious reporting and the prejudices stirred by those few with an axe to grind in the women’s rights movement, and from a segment of the law enforcement community who could not stomach the defeat of their preferred candidate for sheriff, despite all these forces aligned against Mirkarimi, it is beginning to seep into public consciousness that something is rotten in Denmark. The forces that have long controlled City Hall have grown very accustomed to the log rolling, political patronage and maneuverings around resignations and their replacements and the chain reaction effect thereof that they think it is the only way city business can be transacted. With them it’s my way or the highway. Mayor Lee is only the latest in a parade of marketable personalities the regime uses to fix things according to their agenda. Any local policy wonk or sophisticated follower of the political scene here knows what I’m talking about. I don’t have the time or space to fill in the details going back through the disastrous Newsom mayoralty, the Brown administrations and before. It’s real, folks, and the upshot is known as the golden rule: those who have the gold make the rules. The Occupy movement has stirred political awareness. I’m reminded of what was in the air back in the sixties and seventies when outrage over the vile and neverending war in Vietnam boiled over everywhere and people poured into the streets to express their rage. These youngsters nowadays who have seen what is going down with their own futures, are educating people everywhere and they won’t stop until there is real change. From the bottom of my heart I say more power to them. All power to the people. This is America and this is my beloved San Francisco and we have some serious housecleaning to do. So I urge everyone to look beyond the personal aspects of the Mirkarimi case to the bigger picture of what is being attempted: a vile power grab by any means possible of the office of Sheriff, which is just business as usual by the downtown interests, the San Francisco Chronicle and the entrenched machine in City Hall. This shall not stand, and furthermore it must lead to real reform of the way things have been done for far too long now. STOP THE MACHINE–A committee for the defense of Ross Mirkarimi– that is our vehicle. You’ll be hearing more about this as time goes along. Also, though it’s irrelevant to this pleading, I’d like to know whether Aaron Peskin, when he called on Ross to resign, was speaking with the authority of the DCCC. As a registered SF voter I voted for Ross Mirkarimi to become the new sheriff of SF. The endorsement of Michael Hennessey was a major factor in my decision to support him. I do not agree with the suspension and I do not think the trial in the court of public opinion was proper. This whole thing smells like political persecution and as a registered voter I am not in agreement with any part of this trial or the results so far. the amount of financial taxpayer dollars spent on this case is not appropriate and those dollars should be spent to prosecute some of the drug cases that were thrown out of court for cases botched when Gascon was SF Police Chief. Let’s call a spade a spade. He resigned as police chief and was immediately appointed DA so the DA could assume her new role in Sacramento. In my opinion make no mistake about it referring any case to her is tainted fruit no matter how you look at it. Her endorsement of Gascon is never going to get a fair result!! As a registered SF voter I voted for Ross Mirkarimi to become the new sheriff of SF. The endorsement of Michael Hennessey was a major factor in my decision to support him. I do not agree with the suspension and I do not think the trial in the court of public opinion was proper. This whole thing smells like political persecution and as a registered voter I am not in agreement with any part of this trial or the results so far. the amount of financial taxpayer dollars spent on this case is not appropriate and those dollars should be spent to prosecute some of the drug cases that were thrown out of court for cases botched when Gascon was SF Police Chief. Let’s call a spade a spade. He resigned as police chief and was immediately appointed DA so the DA could assume her new role in Sacramento. In my opinion make no mistake about it referring any case to her is tainted fruit no how you look at it. Her endorsement of Gascon is never going to get a fair result!! That’s why they call him Luke the Scoop, or should, where City Hall’s concerned. I’m also interested in seeing David Waggoner in action for the first time, if there’s any way I can find time to attend one of these hearings. IMHO, this stands a very good chance. Cheerleading aside, I’m grateful to Ross for hanging in, defending himself, because I hate the thought of the cynicism and fear that will prevail if the machine prevails in grinding him and his family up and spitting them out like so much cat chow. If Theo grows up to understand that his father not only went to counseling, got control of his anger, and stuck by his family, but also beat the machine, he’s likely to be one very proud kid.